In July this year, Liberal Democrat MP Stephen Lloyd, interviewed by The Guardian, described the current system of assessment for ESA conducted by Atos as being ‘feared and loathed in equal terms’ by those forced to undertake it. He is not wrong. In fact, since Atos won the contract for benefit assessment services in March 2005, under the administration of the previous Labour government, the company has attracted continual and deepening criticism and controversy which has grown steadily worse under the term of the present coalition government. More seriously, the system is now so deeply hated that it has even driven some to commit suicide. Take, for example, the case of a patient on a psychiatric ward who chose to slit her own throat. There was also the retired teacher who suffered a stroke leaving her in a wheelchair and blind in one eye and who left a note reading “by the time you find this I shall be dead.” There was the gentleman who won a tribunal claim but was called in again for assessment and again refused benefit and who chose this time to hang himself. Another man was found hanging in a wood near Lyndhurst by walkers, another was a former Scottish author who once rose to international fame alongside the likes of Irvine Welsh in the 1990s but who killed himself in his Edinburgh flat. The woman found dead in a drain, the pensioner who drove her mobility scooter into a lake, the list goes on and on. The government has lauded Atos Healthcare’s ‘achievements’ claiming that as a result 37 percent of the initial 141,100 claimants re-assessed for ESA had been judged fit for work with the remainder being eligible for benefit. Of these, according to a press release issued earlier in the year by the Department of Work and Pensions (DWP), 34 percent were placed in the ESA ‘Work Related Activity Group’ where they receive support to help them move into work with 29 percent remaining in a separate ‘Support Group’ where they receive unconditional financial support having been deemed to be unsuitable for work. In total, 1.5 million Incapacity Benefit claimants are being re-assessed, a procedure involving the completion of Work Capability Assessments (WCA’s). According to the DWP these assessments were developed in association with medical experts and disability charities and the department also took the step of employing medical specialist Professor Malcolm Harrington CBE to review the system. He in turn approached leading medical charities such as MIND, Mencap and the National Autistic Society in order to obtain their views on how the mental, intellectual and cognitive descriptors used in the WCA should be refined. The apparently rigorous approach taken by the government may sound impressive if you’re one of those concerned about the country’s benefit bill, but the truth of the matter is that the strategy as a whole is deeply flawed to say the least. To begin with, the figure of 37 percent claimed by the DWP is incorrect. According to Sarah Poulton writing in The Daily Mail shortly after the department issued its press release, the actual figures recorded in the pilot re-assessment schemes were only 22 percent, and that was before all the various appeals against judgements started to flood in. And there have been many appeals. Figures released by the mental health charity MIND show that out of the cases brought to appeal by claimants between April and October 2011, almost half, around 40 percent, were successful. In other words, 37,100 people were wrongly diagnosed as being fit for work. This figure increased to 67 percent when appeal cases were conducted by a legal representative such as a solicitor or benefits advisor. This is a huge failure rate and one that is totally unacceptable. It is also highly expensive given that the appeals procedure costs the country around £50 million a year yet the human cost that it represents however is far more serious. Conducting its own investigation, The Daily Mirror found that over a thousand Incapacity benefit claimants had died after having been refused ESA and told to get a job. In total, according to information obtained by the paper through a Freedom of Information request, 1,100 claimants died between January and August last year after they were put into the ‘Work Related Activity Group’ of the ESA. Figures released by the HM Courts and Tribunals Service have shown the WCA procedure to be at the very least unreliable. It has also been widely criticised by medical charities and, earlier this year, the chief executive of MIND, Paul Farmer, resigned from the government’s official advisory panel. Farmer unreservedly denounced the WCA as inhumane and commented that it was not only “not fit for purpose” but that it was also extremely crude. The government responded by claiming that he had been sacked after MIND launched legal action over the fairness of the tests. The British Medical Association (BMA) have also attacked the WCA. At their Annual Representative Meeting this year, they called for the computer system associated with it to be scrapped with immediate effect and that it should be replaced by a ‘rigorous and safe system that does not cause unavoidable harm to some of the weakest and vulnerable in society’. So are these accusations of inhumanity justified? Two in-depth investigations by the BBC and Channel Four certainly seem to indicate as much. Both used secret filming to uncover the criteria used by Atos assessors to investigate and re-assess claimants. In Channel Four’s Dispatches documentary Britain On The Sick, one assessor says that as long as you have one finger and can press one button you don’t score anything. In other words the golden rule seems to be that if there is even a slight possibility that a claimant can do anything at all then benefit is denied. As if this wasn’t bad enough both programmes uncovered significant evidence suggesting the existence of a target-driven culture within the assessment procedure, despite subsequent denials by DWP. The Employment Minister, Chris Grayling MP, has defiantly insisted that there are no such targets, yet Channel Four found that Atos put their assessors on ‘targeted audit’ if they put too many people into the Support Group of the ESA. It also discovered that assessors were finding only about 12-13 percent of Incapacity Benefit claimants unfit for work with the rest being compelled to find a job. Dr Bick himself said that of the eight cases he assessed before resigning, Atos had subsequently asked him to review his decision on four of them. One assessor Dr Bick spoke to commented that he felt the system indeed creates the feeling that there are targets. If that is true, even if there aren’t any targets, assessors at Atos certainly seem to think there are, and that is something that should be of grave concern to both the government and the country. So, is there a gross lack of communication going on here or are we just being lied to? The matter becomes even stranger when you consider the circumstances of Professor Harrington who was called upon to review the WCA. His annual reports on the WCA actively criticised Atos and one of them resulted in a fall in the numbers of claimants being awarded benefit. He concluded that the system needs to be made more humane. Rather than accepting his findings, someone, somewhere informed him that perhaps a “fresh set of eyes” was needed. In other words, despite his denials that he was being sacked, the DWP terminated his employment. For its part, the DWP has of course also denied that Harrington had actually been sacked and stated in their defence that he had only been employed to carry out three reviews anyway. Yet the department has also denied permission for the BBC to examine the contract it holds with Atos. Furthermore, Atos has consistently refused to make available information concerning the coding and specifications of the software used for the assessments, on the basis of ‘commercial interest’. Some of these requests have been made through Freedom of Information Act applications, but they have still been rebuffed. In essence what is really going on here is that the government is using Atos to help it slash the country’s benefits bill so that it can claim that ‘over half of new claimants are found to be fit for work’. This has enabled the Employment Minister, Chris Grayling, to continue the Tories’ ongoing attack on Labour by describing the previous government’s welfare policy as an ‘outright failure’. The disabled are essentially being used by the government to play politics, and in consequence lives are being lost. That is an outrage of the highest order. The vehemence of the government against the disabled becomes apparent with every news item you read about the matter. For instance, instead of taking notice of the sheer amount of successful appeals won by claimants, the government has instead decided to restrict legal aid for anyone seeking to overturn unjust decisions. Even worse, only a week after the Welfare Reform Bill was granted royal assent, the Coalition announced that it was going to close factories run by Remploy which employs disabled people. In total, 36 out of 54 factories are scheduled for closure resulting in compulsory redundancy for 1,700 disabled workers. So, even for some of those denied benefit, their chances of getting a job of some description have been sabotaged by government cuts. Channel Four went on to ask the DWP for an interview, but perhaps unsurprisingly this was denied. The department even had the nerve to express concern over Dr Bick’s political past – he stood as a candidate for the Labour Party in 2010 – visibly demonstrating the Conservative-driven agenda to rubbish and ridicule Labour supporters at every given opportunity, irrespective of the consequences for the UK’s weakest and most vulnerable citizens. Disabled people just want to be treated fairly, but the attitude of the government with their thinly-disguised attempt to use the country’s most vulnerable citizens as a means of driving down the welfare bill seems a particularly sick, even sadistic, response and, I would argue, reveals just how vicious the Coalition government’s persecution against the disabled has become. It is not surprising therefore that people affected by such unfair judgements are choosing instead to commit suicide. It is also not surprising to see a growing and vehemently active resistance against the cuts. 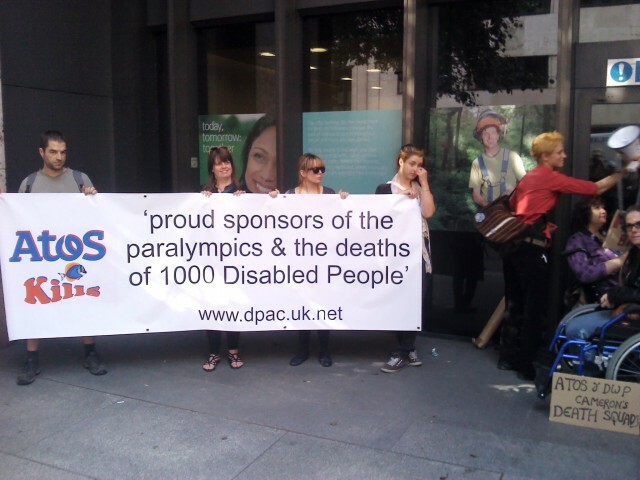 Both UK Uncut and Disabled People Against The Cuts (DPAC) have marked the closing ceremony of the 2012 London Paralympics by participating in an attempt to close down Atos headquarters in central London on 31st August. At least 200 activists blockaded the doors of the DWP on the day with another 20 having managed to get inside the building. Predictably there was no mention of the action on the BBC main news, but Channel Four certainly featured it, leading to even more awareness of this issue throughout the country. Both organisations have actively resisted the government’s disability benefit “reform” programme from the time it emerged in the Welfare Reform Bill, and the action was described as being just as ‘audacious, daring and disruptive’. As for Atos, the government has recently awarded them another contract, this one worth £400 million, for it to assess Disability Benefit. The fight goes on it seems, and I suspect this may only be the beginning.